West also posted a text exchange between himself and artist John Legend who asked the rapper to rethink his position on Trump. Trump says in an interview with "Fox & Friends" that West has "good taste" and sees the decline in unemployment rate among black and Hispanic Americans. 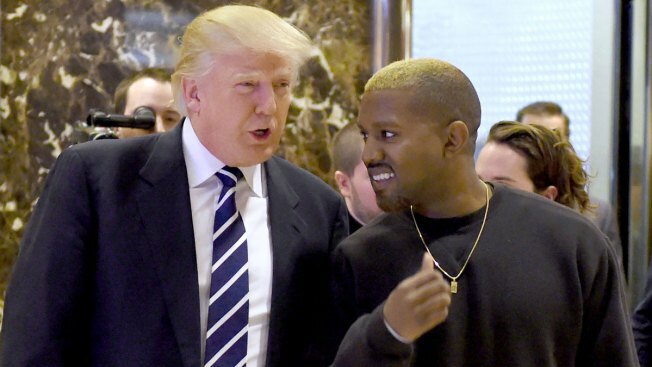 West recently offered his support for Trump in a series of tweets, saying they both share "dragon energy." That caused a backlash among other public figures who oppose the president. In a tweet on Thursday, West wrote that while hate is a similar emotion to love, "hate is not the answer." He also began tweeting a text exchange between himself and artist John Legend after the Grammy winner asked him to rethink his position on Trump. West also tweeted a link to a TMZ.com story about himself with a headline that described West as "the opposite of erratic." The story noted that West is releasing a new album in the coming months. He has recorded several best-selling albums and produced a buzzy fashion line and has the undeniable talent for attracting attention. He's also been linked to several previous presidents, including when Obama called him "a jackass" in 2009 for storming the stage at an MTV awards show to interrupt Taylor Swift. And in 2005, during a telethon to raise money for the victims of Hurricane Katrina, West criticized the White House's response to the storm by famously charging that "George W. Bush doesn't care about black people."